Some great news today about the Dublin-based offices of one of the world’s largest banks (and companies) selecting the An Saol Foundation, completely out of the blue to us, as their charity of the year. Wells Fargo, the company that operated the famous Pony Express, will support An Saol in their work allowing survivors of very severe acquired brain injuries to live their lives with dignity and respect. – This is all down to one person who made it happen, who did not give up when she explained to her colleagues that this is the right thing to do! 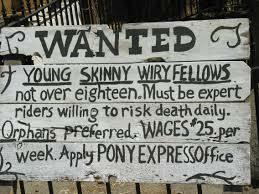 Their job ads have changed since their early days, I am sure, and so must have the risks involved for their employees. Although – banking has never been risk-free. This is a FIRST for An Saol and, at least in my mind, a huge recognition by a huge company and their Dublin office of the importance of the work of An Saol for sABI survivors, their families, and society in general. As Patrick’s Day is approaching, we are slowly getting ready for another very brief trip to Germany to visit the Munich and the Therapy Centre in nearby Burgau with Pádraig to see one of their consultants and therapy leads.